On Friday, June 29, Porsche smashed the all-time Nürburgring Nordschleife record that had stood for 35 years and that many believed would never be touched. 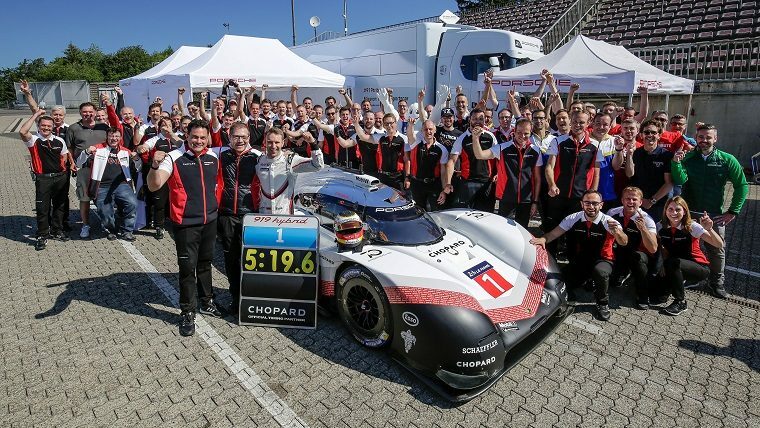 While at the wheel of a highly-modified Porsche 919 Hybrid, dubbed the 919 Hybrid Evo, two-time Le Mans winner and reigning WEC champion Timo Bernhard lapped the circuit in only 5 minutes and 19.55 seconds, beating the record that Stefan Bellof had set in 1983 with the insane Group C-compliant Porsche 953 by more than 50 seconds. That Porsche beat the record to begin with is impressive. That it did so with such a high margin is staggering. In the racing world, a few seconds are an age. For comparison, the Porsche 918 Spyder, the quickest of the hybrid supercar trifecta, “only” lapped the circuit in 6:57.00, and the record among production cards is held by the Porsche 911 GT2 RS with a 6:37.3. Over the course of the 12.94-mile circuit, the 919 Hybrid Evo maintained an average speed of 145.3 miles per hour and reached a top speed of 229.3 mph. The car’s record-setting run at the Nordschleife marked just the second stage in what Porsche calls the 919 Tribute Tour: a series of stops around the world intended to show off what the 919 Hybrid is truly capable of when unchained by LMP1 regulations.